Nervous Baghdad parents kept children home from school on Saturday, but warnings of an insurgent "Day of Resistance" and a call for a general strike otherwise had limited impact across Iraq, as U.S. authorities moved to counter an intensifying insurgency. More Iraqi security forces will be trained and deployed more quickly to deal with the anti-U.S. resistance, said U.S. occupation chief L. Paul Bremer. "It will take time to root them out," Bremer told reporters. But his U.S. commander said it was still not known who "they" are, financing and masterminding increasingly coordinated strikes. Bremer said Saddam loyalists had failed to rally Baghdadis around them. "My understanding is there was a drop-off in schools (attendance) but there was no general strike," Bremer said at a Baghdad news conference. "Business was active and usual." The top U.S. commander in Iraq, Lt General Ricardo Sanchez, sought to put a positive spin on events. "I would like to (state) unequivocally that we are winning the global war against terrorism, and I remain absolutely convinced that we are also winning in this country," Sanchez told the same news conference. Those attacks spiked upward recently to an average of 33 a day. Most occur in central Iraq, but Saturday's deadliest blow came in the north, in the city of Mosul, where the U.S. military said a makeshift roadside bomb exploded and killed two U.S. soldiers and wounded two others as they drove by in two civilian vehicles. Some 100 miles north of Baghdad, near Saddam Hussein's hometown of Tikrit, an explosion and fire struck an oil pipeline, a favorite target of the resistance saboteurs since oil is key to U.S. plans to rebuild Iraq's economy and remake its politics. Some American military officers in Iraq are pressing to reconstitute entire units of the former Iraqi Army, which the top United States administrator in Baghdad disbanded in May, The new York Times reports in a story prepared for its Sunday editions. The Times says the officers feel the change "would speed the creation of a new army and stabilize the nation." Saturday's Times says young militant Muslim men are answering a call by Osama bin Laden and other extremists across the Middle East and Europe, and leaving home to join the fight against the American-led occupation in Iraq. "Intelligence officials ... estimate that hundreds of young men from an array of countries have now arrived in Iraq by crossing the Syrian or Iranian borders," the Times says. But the newspaper cautioned that "officials say this influx is not necessarily evidence of coordination by Al Qaeda or other terrorist groups." President Bush insisted Saturday in his weekly radio address that an upsurge in violence will not cause America to leave Iraq prematurely. Mr. Bush said U.S.-led forces are rounding up insurgents despite the new attacks. "The terrorists and the Baathists loyal to the old regime will fail because America and our allies have a strategy, and our strategy is working," Mr. Bush said in his weekly radio address. 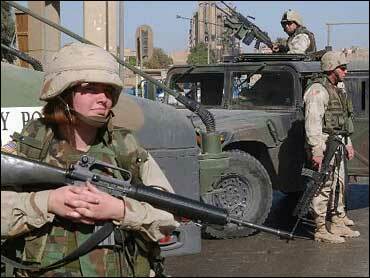 Insurgents attacked a U.S. convoy Saturday near Heet, 75 miles northwest of Baghdad, witnesses said. They said one man held up part of the wreckage from one vehicle and shouted, "With our blood and souls, we sacrifice for you, Saddam." U.S. military spokesmen had no confirmation of the attack. Iraqi officials declined a last-minute invitation to attend a meeting of neighboring states to discuss the impact of the U.S.-led Iraq war on the region and rejected beforehand any decisions the Damascus conference might take. Iraq's U.S.-appointed administration said Saturday it could not honor a late and ambiguous invitation from Syria that it considered an affront to Iraq's dignity. The U.S.-appointed Governing Council wanted to attend the meeting and complain about cross-border infiltration of militants, including from Syria. The U.S. military said two U.S. soldiers from the 101st Airborne Division were killed and two wounded in the roadside bombing in Mosul. The two deaths would bring to 122 the number of American soldiers killed by hostile fire since President Bush declared an end to combat on May 1 when added to the total given by the Department of Defense on Friday. A total of 114 U.S. soldiers were killed between the start of the war March 20 and the end of April. It was a street leaflet attributed to the fugitive ex-president Saddam's Baath Party that called for a three-day general strike and declared Saturday a "Day of Resistance," sparking rumors of planned new terror bombings. This came just days after four coordinated suicide bombings in Baghdad last Monday killed about three dozen people and wounded more than 200, almost all Iraqis. Despite these fears, many shops in this city of 5 million people opened Saturday as usual, although fewer Baghdadis seemed willing to venture out in the morning. Traffic picked up as the day wore on, however, and as people realized no siege of bombings had materialized. Police checkpoints had been set up across the city. "I went out as usual and sent my children to school," said one resident, Karima Dawth. "Warnings by Baathists don't terrify us." Most parents seemed to feel otherwise, however, as schools reported very low attendance. In Iraq's second- and third-largest cities, Basra and Mosul, there was no sign of strike action. Shops were open and traffic appeared normal. The "Day of Resistance" threat had prompted some Western governments to issue warnings to their citizens here. The U.S. authorities urged Americans to "continue to maintain a high level of vigilance," since the vague threats seem to cover a two- or three-day period. "There's no denying this has been a tough week," Bremer said at the start of Saturday's news conference. He noted it began with a rocket attack a week ago on Baghdad's Al Rasheed Hotel, home to hundreds of staff members of his Coalition Provisional Authority. The barrage killed a U.S. Army colonel and wounded 18 other people. The following day, four near-simultaneous suicide bombings killed about three dozen people and injured about 200 in the capital, prompting the international Red Cross, the United Nations and other organizations to withdraw foreign staff. U.S. officials have blamed former Baath Party figures, foreign fighters and Islamic extremists for the upsurge in attacks. Bremer told reporters that capturing or killing Saddam was a "top priority" of the coalition forces, but he dismissed recent reports that the ousted leader is taking a strong role in organizing the anti-U.S. resistance. "We have no clear indication that Saddam himself is behind these attacks," he said. "There is some sign of control over these attacks at a regional level." Bremer said the coalition, once it gets additional money from Congress, will accelerate the building of the new Iraqi army, police and other security forces. "This is after all their country," Bremer said. "It is their future." He said the coalition will double the size of the Iraqi Civil Defense force by March, and accelerate the recruitment and training of more Iraqi police and soldiers. Bremer said he hoped to make quick progress with the U.S.-created Iraqi Governing Council on the first key step to handing over sovereignty to Iraqis, a decision on how to draw up a new constitution. Bremer also said the Americans would "seek ways to accelerate the transfer of authority to the government of Iraq for the governance to Iraqis." He said he hoped to make quick progress with the U.S.-created Iraqi Governing Council on the first key step, a decision on how to draw up a new constitution. "We are prepared to provide a path and a timeline with the Governing Council," he said.